Absolutely amazing! This fabulous vacation rental will astound your family and fill your visit with grace! Constructed by one of the premier builders with breathtaking décor and amenities galore for you to enjoy, they have thought of everything! The top level living area offers good ocean views, a chef’s kitchen and space to relax and enjoy the sea breeze and each other. Bedrooms are decorated for a quiet, relaxed space. The ground level has the action with a rec room with pool table, kitchenette with a dishwasher and mini fridge with icemaker (convenient for drinks and snacks), and access to the gated poolside patio. The hot tub is located on the ground level patio right by the pool! The poolside cabana doubles as your own private sports bar with 32 Inch LCD TV and a mini fridge with icemaker. The kids will love the landscaped lawn around the pool! The close access to the beach gives you plenty of beach time! Imagine spending all day with the kids, building sandcastles, surfing, fishing, and relaxing with a cold drink under the umbrella. Tired of the sand? Move the party back to the house to enjoy your own private resort in the back yard, or cool out in the house watching movies, or playing games. The top level screened porch will be the main gathering space with ocean views and cool breezes. Top-Level: Great Room with Smart TV, Blu-Ray player, Electric Fireplace, Access to Screened Porch with Ocean View, Kitchen has 2 Dishwashers, 2 Full Size Refrigerators with Icemakers, Dining Table seats 14, Table seats 8, Half Bathroom, King Master with 32 Inch LCD TV, Ocean View, Whirlpool, Tile Shower; Queen Master with 32 Inch LCD TV, Shower with seat. Mid-Level: King Master with 32 Inch LCD TV, Tile Shower, and Deck Access with Ocean View; King Master with 32 Inch LCD TV and Deck Access with Ocean View; Queen Master with Roll In Shower, hand held Faucet, and fold down Seat, Roll under Sink, and Deck Access overlooking Private Pool; Master with Bunk Bed (D/D), Bunk Bed (T/T), 32 Inch LCD TV; Laundry with Washer/Dryer. Ground-Level: Rec Room with full size Pool Table, Kitchenette with Dishwasher, Refrigerator, Microwave, and Sink, Game Table seats 4, Access to Patio leading to Gated Pool Access with Hot Tub, Queen Master with 32 Inch LCD TV; Bedroom with a Double Bunk Bed with 32 Inch LCD TV; King Bedroom with 32 Inch LCD TV, shares access to Hall Bathroom; Laundry with full size stackable Washer/Dryer, Outside there is a Hot Tub and Poolside Cabana Bar with 32 Inch LCD TV and Full Size Refrigerator. 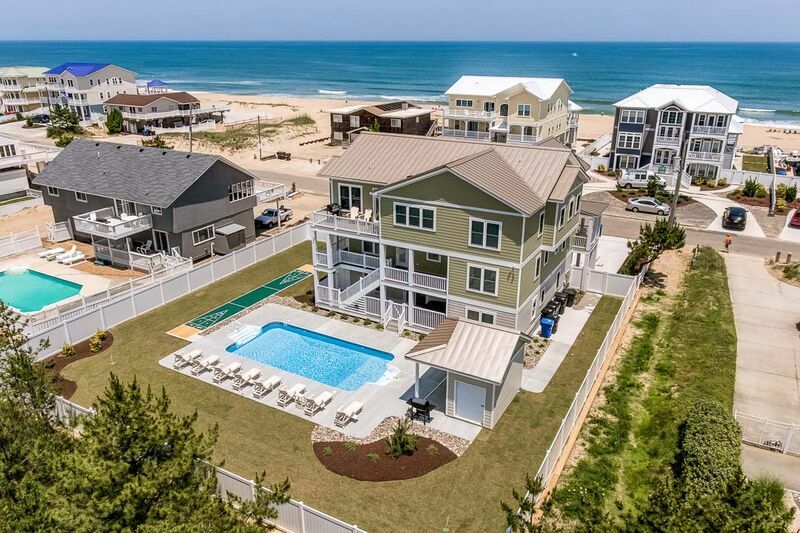 Extras: Private Pool (11 x 22), Hot Tub (8), Elevator, Blu-Ray DVD, Full Size Pool Table, 3 Dishwashers, 4 Refrigerators, 2 Microwaves, 2 Washers, 2 Dryers, Electric Fireplace, Screened Porch, No Smoking, PETS NOT ALLOWED, Parking: 9 Cars, Distance to the Beach: 350 ft.